Over the past decade the focus of sustainability researchers has broadened to explore management controls for sustainable business practice. This paper contributes to the emerging area of interest on understanding the roles management controls play by presenting a review of the literature that specifically focuses on the relationship between management controls and sustainability strategies. 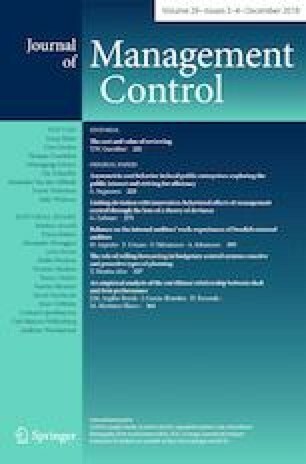 The paper shows that the current literature predominantly focuses on exploring controls from a management control design perspective, mostly informed through the case study based approach while concentrating primarily on large firms. Nine key themes arising out of the review of the literature are presented. The limitations of current research are subsequently addressed and avenues for further research are presented and discussed. Benn, S., Dunphy, D., & Griffiths, A. (2014). Organizational change for corporate sustainability. E-book. http://ntuuk.eblib.com/patron/FullRecord.aspx?p=1687461. Accessed 23 November 2015. McKinsey (2011). The business of sustainability: McKinsey Global Survey results. https://www.mckinsey.com/businessfunctions/sustainability-and-resourceproductivity/our-insights/the-businessof-sustainability-mckinsey-globalsurvey-results. Accessed 12 Nov 2017.